Macedonia deputy prime minister and defense minister Radmila Sekerinska announced Tuesday that Macedonia would receive an invitation to join NATO next week. According to Sekerinska, the membership invitation to Macedonia will be extended in Brussels during the summit scheduled for July 11 and 12. Meanwhile, the Macedonian government adopted the strategic defence review (SDR) earlier on Tuesday. "It took one year to complete the SDR, which is an ambitious and crucial document that defines defense and its development, as well as the defense agenda of the country," underlined Sekerinska. The head of the Greek government’s junior coalition partner said Tuesday he will not allow a deal the country recently made with neighboring Macedonia over the latter’s name to be ratified until it has voter approval, either through general elections or a referendum. The statements by Defense Minister Panos Kammenos, who is the head of the right-wing Independent Greeks party, indicate he is prepared to bring down the coalition government over the deal that renames Greece’s northern neighbor North Macedonia. “The deal for me is bad. I do not accept this deal, and I will try to block it,” Kammenos said. Greece has long objected to use of the term “Macedonia,” saying it implies claims on the Greek province of the same name. The deal reached last month has met with strong objections in both countries, with opponents saying it concedes too much to the other side. Several demonstrations in Greece over the issue have turned violent. Greece’s parliament is to vote on the deal only after Macedonia has completed all steps required on its part, which includes constitutional changes. Macedonia’s parliament recently ratified the deal, but the country’s conservative president has refused to sign off on it. Macedonia’s main opposition party has filed treason charges against its prime minister, Zoran Zaev, for agreeing a historic deal with Greece to change his country’s name. The deal signed last month would see the ex-Yugoslav republic adopt the name North Macedonia, in exchange for Greece lifting its objections to Macedonia launching talks to join the European Union and Nato. The issue has poisoned relations between the Balkan neighbours since Macedonia gained independence in 1991, because Athens said that its use of the same name as a province in northern Greece implied territorial designs on that area and a claim to the legacy of Alexander the Great, the storied ruler of ancient Macedon. Western powers have warmly welcomed the deal but it is fiercely opposed by nationalists in Greece and Macedonia, and still faces potentially difficult hurdles in both countries before it can come into force. The nationalist VMRO-DPMNE party said it had filed charges including treason and abuse of office against Mr Zaev, his foreign minister Nikola Dimitrov and parliamentary speaker Talat Xhaferi “and all those deputies who voted for this capitulatory, unconstitutional and unlawful agreement with Greece”. Deputies from VMRO-DPMNE – which was ousted last year after a decade in power – abstained from a parliamentary vote on Thursday in which the deal was approved for a second time. President Gjorge Ivanov, an ally of the nationalists, refused to sign the deal after it was first ratified last month. After the second vote he cannot legally block the agreement but he is likely to maintain his refusal to sign it, stoking political tension ahead of a referendum on the name change that is expected to be held in late September or early October. The referendum will be hotly contested, and the deal also obliges Mr Zaev to pass changes to the Macedonian constitution, a move that requires a bigger majority than he currently enjoys in parliament. The deal has split the governing coalition in Greece, where prime minister Alexis Tsipras must also secure backing for the agreement from a deeply divided parliament. During a debate in the chamber last month, a deputy from the far-right Golden Dawn urged the military to stage a coup and arrest Greece’s leaders to prevent the deal going through; he has since been expelled from the party and charged with treason. By contrast, the EU, US and most of the countries’ neighbours have hailed the agreement, and Macedonia hopes to receive a formal invitation to start membership talks with Nato at its summit next week. US vice-president Mike Pence congratulated Mr Zaev and Mr Tsipras by telephone on Thursday evening, and praised their leadership and courage in reaching a deal that he said would strengthen peace and stability in the Balkans. The seven were found guilty of trying to kill ethnic Albanian Ziadin Sela, leader of the small Alliance of Albanians party. He was hospitalized with severe injuries following the attack. On April 27, 2017, some 100 nationalists, many of them masked, stormed the assembly in Skopje to protest against the choice of a new parliamentary speaker, an ethnic Albanian who had served as a defense minister in a previous conservative government. Several other people, including legislators, journalists, and police officers, were also injured in the bloody rioting. "The accused men tried to kill MP Ziadin Sela. The evidence against them was clear from the video material," said judge Slavica Andrevska. "My life is ruined. I am done," said Nikola Vojmoinovski, who received a 13-year jail term along with two other defendants. Four of the men received 10-year sentences. Some of the convicts wept when the verdicts were announced. All the defendants had pleaded not guilty and defense attorneys said they would lodge an appeal. In March, Macedonia's state prosecutor charged another 30 people over the April 2017 attack. Their trial is expected to start on August 22. The 30 accused include five legislators from the opposition conservative VMRP-DPMNE party and senior Interior Ministry officials, who have been charged with "terrorist endangerment of the constitutional order and security." A man who pleaded guilty to having attacked another legislator in the violence was sentenced in March to four years in prison. The attack on parliament, which was strongly condemned by the European Union and the international community, followed a long-running political crisis in the Balkan country. A month after the violence, Social Democrat Zoran Zaev -- who was beaten up in the riots -- became prime minister. SKOPJE, MACEDONIA — Macedonia's president is insisting that he will not sign off on a deal with Greece to change his country's name, even after parliament ratified the agreement for a second time. A press release from Ivanov's office Friday said his position "will not be changed by any pressure, blackmail and threats." Under Macedonia's constitution, Ivanov can only reject legislation approved by parliament once. But he must approve it if lawmakers back it again — as happened on Thursday with the name deal. However, Ivanov might indefinitely delay signing off on the deal, triggering a constitutional crisis. The Macedonian parliament ratified for the second time an agreement signed with Greece to change the former's name after its president temporarily blocked the deal last week. Sixty-nine out of 120 lawmakers voted in favor of the agreement. Macedonia’s president announced last week that he would not sign a landmark deal with Greece to change his country’s name after the Macedonian parliament ratified an agreement on June 20. Speaking in parliament in Skopje, Macedonian Foreign Minister Nikola Dimitrov on Thursday said: "The agreement does not harm Macedonia's identity and language, but rather strengthens it as never before." "According to the law, after this vote President Gjorge Ivanov is obliged to sign the agreement. The statement Ivanov made on the agreement is not true," Dimitrow said. On June 17, Greece and its northern neighbor signed a historic accord on renaming Macedonia, ending a long-standing dispute between the two countries. The deal proposes changing Macedonia's name to the Republic of North Macedonia and will enable Greece to lift its veto on Macedonia's EU and NATO accession. Greece, both a NATO and EU member, has long opposed Macedonia’s official name, as it has a region by the same name in the north of its country. Due to Athens’ veto, the dispute has been one of the main obstacles to Macedonia’s ambitions to join NATO and the EU. Negotiations between Macedonia and Greece had recently stepped up, as the new government in Skopje sought progress in its bid to join NATO and the EU. Macedonia has never been closer to solving its 25-year name row with Greece, but even if it fails Skopje will continue to integrate with Europe, its premier says. “I believe that we have never had better circumstances to find a complete solution that will last for centuries and will remain forever,” Prime Minister Zoran Zaev told AFP in an interview. The long-running name dispute between Macedonia and EU-member Greece dates back to 1991 when Skopje declared independence following the collapse of communist Yugoslavia. “If the dispute is not solved, the world will not end,” Zaev said. 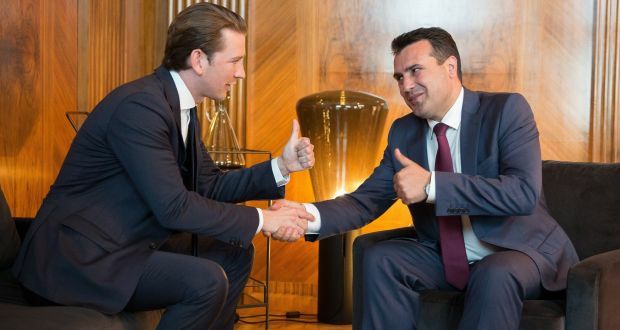 UN mediated talks to settle the row have resumed since Zaev’s Social Democrats won elections last year, ousting the nationalist VMRO-DPMNE party of Nikola Gruevski after more than ten years in power. The negotiations have made progress after Macedonia agreed in February to change the name of the capital’s Alexander the Great airport to Skopje International Airport, in a goodwill gesture to Greece. Macedonia had also been accused of appropriating symbols and figures that are historically considered part of Greek culture, such as Alexander the Great. Zaev said he was “satisfied” that “a huge part of the issues” between Macedonia and Greece had been solved and that he was optimistic about a final deal. “This is a message of open doors. That is very important for Macedonia,” he said, adding that more than 75 percent of Macedonians are in favor of the country’s integration into the EU and NATO. However, “that does not mean that we should not improve cooperation with other countries, including the Russian Federation,” Zaev said. Russia has openly objected to the aspirations of fellow Slavic countries in the Balkans to join NATO, most recently when Montenegro became a member in mid-2017. “I want to improve cooperation with Russia,” Zaev said. By Oxford Professor James Pettifer - A personal view of the "name dispute" between Macedonia and Greece: Macedonia must end the name negotiations. OXFORD, UNITED KINGDOM, April 22, 2018 In a speech on April 15th, 2018, as reported in the Athens newspaper ‘Kathimerini’, NATO Secretary General Jens Stoltenberg called on Greece and Turkey to improve their relations and also stated that their current difficulties which have led to a military fatality last week are not a matter for NATO. At first sight this is a reasonable point of view, from a distinguished international figure and is a view that should be respected. But it is also bound to raise the issue in people’s minds, ’What is NATO actually for’ when two NATO members in the eastern Mediterranean region may be edging towards a wider conflict, in the view of many observers. It is against this background that the hapless Macedonian and Greek Foreign Ministers are continuing their weary rigmarole of staged meetings, where all that is on the table are a series of name possibilities, most of which have been around for ten years of more, and all of which offend major opinion constituencies in both countries. The back ground to the NATO and EU pressure is also unpleasant in other ways. The two countries are being treated like adolescents, by the ‘grown ups’ that belong to the EU and NATO when in fact a good deal has been done quietly, bilaterally, to improve relations. People from the Republic of Macedonia travel on vacation to Greece and do business without difficulty, people from Greece are visiting centres like Ohrid and have a pleasant time and are made welcome. There are, however, significant human rights issues relating to the use of the Macedonian language, and cultural politics in northern Greece, and these must be dealt with. Remember that the European Court of Human Rights, European Commission Against Racism and Intolerance, and the United Nations itself, have repeatedly demanded that Greece (and Bulgaria) immediately recognize their large Macedonian minorities - as Macedonians - and end the persecution of them. Basic recognition of an ethnic group's basic human rights is an obvious way to improve relations, not worsen them as Greece and Bulgaria claim. How should the ending of the talks be achieved? Macedonian governments hear more than enough from non-Macedonians about what should be done, particularly from international figures whose real loyalties may lie elsewhere. I am reluctant to comment but it seems to me the best way is, as a sovereign and free nation, that the Republic of Macedonia end the name negotiations because there is never a right time to resolve an issue in which one country/ethnic group does not recognize the other's right to exist. This is a point made by Macedonian Human Rights Movement International's Our Name Is Macedonia campaign.